I'm not sure that it made a LOT more sense, but given the hatchet job that had been done on Hal up until then, it was kind of necessary (IMHO, anyway) to do something like that if he was going to come back as a hero. I blame the Guardians for Parallax. Had they tried to have a rational conversation instead of being a**holes then perhaps Jordan would have calmed down enough to become reasonable again. What bothers me primarily is there wasn't enough foreshadowing. It shoulda been at least a 20-issue foreshadowing arc that prepared the groundwork for Hal losing it. Also, the constant return of Hal as a good guy = silly. What bothers me primarily is there wasn't enough foreshadowing. It shoulda been at least a 20-issue foreshadowing arc that prepared the groundwork for Hal losing it. Well, yeah, if they were going to do it, that would have been the way to do it right. Unfortunately that was impossible, since they made the whole thing up AFTER issue #47 was written (that's why they skipped a month of publishing GL). They scrapped the story they already had (and had solicited) and brought Marz in to write Hal going cuckoo (and wouldn't give him any more than three issues to do it, even though he wanted more, since it HAD to be done by the nice round anniversary of issue #50). So the lack of forshadowing is to be expected. Hal was angry at the Guardians for years, but it wasn't enough. He just snapped with the Coast City debacle. They definitely needed more lead-in time. At the very least, #47 should've been skipped! At the very least, #47 should've been skipped! That would have been a good idea for more than one reason. Skipping #47 would have helped with the setup for #48-50 because they would have avoided all the exposition about Hal coming to terms with the loss of Coast City, and moving forward that made it so jarring when the next issue showed him mad with grief from the very beginning. Plus skipping #47 would have been good simply because, independent of any other consideration, it just sucked, plain and simple. That Swamp Thing garden and the green flame were nice things, I have to agree. Not all was bad in the issue. I think you might be missing out Kid Lantern, many issues of 1-25 are very good and carry on the spirit of Volume 2. They're a little goofy but still a lot of fun, especially the antics of Guy. Before reading Volume 3 I feared they'd be all one-off stories (which bore me) but they are more of a big long arc. Some people prefer it the other way but that's what attracts me to these comics. When does this happen: "the emergency power ring that Jordan once gave Green Arrow"? You mean what issue does he give it to him in? Or what issue do we find out he has it? Because, though I could be wrong, I don't think there was ever an issue showing him giving it to him. It happened off-panel somewhere during Hardtravelling Heroes. We found out about it in Brad Meltzer's Green Arrow run. A couple of asides. The collapse of Jordan and the rise of Rayner is the crux of Volume 3. If you're going to include GL Vol 3 #100-106, you also have to include Green Arrow #146, because, doggone it, there's a two-parter involving Connor Hawke. GL #81 was one of the most poignant, soul-rending books of the run, not only because it showed John Stewart with restored mobility, but also because of the attendees at the funeral...hey, check out those back pews! Isn't that Ollie, with his feet propped up? How often do dead people really show up at funerals? Other sideshow books you need to consider for inclusion are Ganthet's Tale (trade paperback), the Trinity micro-series (7 books: two self-titled, five cross-overs including the Darkstars and L.E.G.I.O.N. books, because whatever retcon you choose to define as Emerald Twilight makes absolutely no sense without these...it was the "fool's errand" that took Jordan off-planet, so he wasn't in California when Mongul showed up), and the short run with Jordan as leader of Justice League Europe. Also, check out some of the "Death of Superman" and "World Without A Superman" arcs for continued deterioration of the character. Oh, I quite disagree. #47 was a dumb but necessary story to close out the Montoya Bay arc. It was scripted to lead into the original Emerald Twilight plot, but look at all the ties to sanity that are cut in #47. Carol tells Hal to get lost because she has to take care of her crazy mother. Olivia Reynolds tells GL to get lost, and would have done it with foot-stamping style had she known GL was Hal. Even Tom Kalmaku doesn't trust Hal by the end of this one, and Ollie is off on a wild goose chase. It didn't happen all at once. But eventually, Hal broke. No past. No anchors. No love interest. Just a hole, the same thing we started Volume #3 with, the cliff at the end of the road. Suddenly, no desire to go on living. Anger simmering, grief mounting, an entire life washed away. Little wonder that, when he paid a visit back to Ground Zero, the shattered doll's head half-buried in the dirt became the final symbol of total failure. He didn't crack irretrievably until all those other support mechanisms were gone. Hey, folks, it happens. May you never have someone close to you go through a nervous breakdown. In retcon-speak, he was easy prey for Parallax through the ring's tachyon net. Parallax or no Parallax, it still makes sense. Even born without fear and totally honest, Hal was human. As a Seattle football fan, I kinda sorta had a problem with a demon named Tuiasosopo. Manu! Manu! Long live the Mudville Maroons! I think you mean Green Arrow #136. But can you give me a two-line summary for Emerald Knights, for example the beginning point in issue #100 and the ending point in issue #106? I don't quite see the importance of this as I haven't read it. Maybe I'm way off but "time-travelling Hal comes from the past and has an emotional epiphany" doesn't look to qualify as a major plot point. Reading through Volume 3, post-Parallax Hal has an emotional epiphany on every f***in page. When does John Stewart lose mobility? What would the plot point of Ganthet's Tale be? Also, I don't know which issues in those Superman arcs would be relevant. I noted Superman #80 since it shows Coast City being destroyed. Having Hal's leave-of-abscence is an important one though, so whenever he leaves, that would be worthy of adding to the list. There is another thread, "Reading Order for Vol 3" that would be perfect to include literally everything mentioned here. Emerald Knights doesn't have any real significance, it's just a nice read. 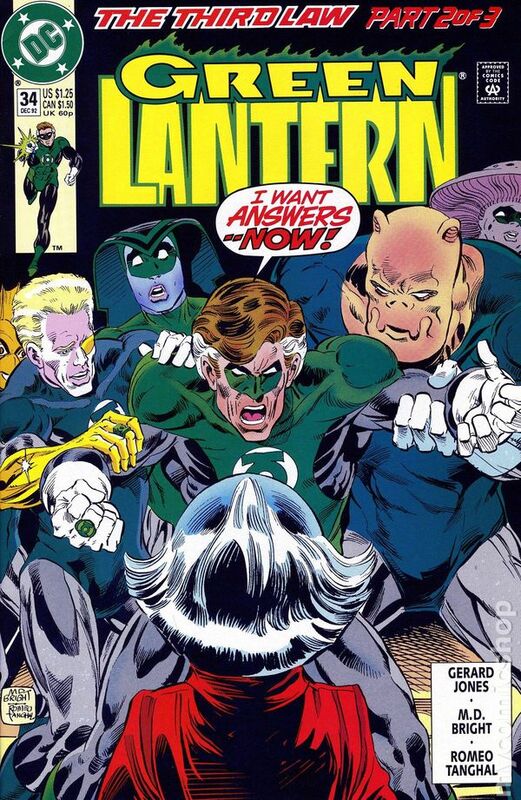 What would the plot point of Ganthet's Tale be? Ganthet's Tale explains the origin of Krona and also the origin of the universe. This is important for the third law storyline, Zero Hour etc. Sorry, I don't see a shred of what you have convinced yourself is there in this. And I feel justified that my vision of it is the truer one since when it was written there was absolutely no plan to make Hal go off the deep end. The change in Hal from this to #48 was so jarring that, when I first read #48 I literally stopped and checked the issue number to make sure I hadn't somehow missed an issue. Hal snapping DID happen all at once. At the beginning on #48. There was no foreshadowing, no build up, no hints. There could NOT have been, since nobody knew when they were writing anything before #48 that he was going to go nuts. While it's true that there may have been no planning and thus no purposeful foreshadowing, you can still read into it that way if you wish. "Art transcends the artist" and all that. John Stewart lost the use of his legs during the fall of the Darkstars on Rann in GL #75. At some point Parallax gave John an energy boost that let him walk again and it left some residual energy John used once or twice [once during Emerald Knights IIRC and again fighting Fatality while Jade was the GL of Earth]. John was crippled again by the end of issue #112, again IIRC. Issue #100 wasn't part of Emerald Knights, just the lead-in. Kyle was in the past first and helped a rookie Hal defeat Sinestro before he and Hal were both sent into the future to Kyle's present at the end of the issue. Emerald Knights was important because it was the first time Kyle met the real Hal, and not Hal as Parallax. It was also the selling point that had Kyle believing a Corps needed to exist, and by the end of the arc Hal gave Kyle a copy of his GL ring that could make more copies. This was a feature Kyle's ring didn't have at the time. Who else does Major Force kill? Seems to kill a lot of chicks. Well he apparently kills Kyle's mom, but then in the next issue we learn it was just a mannequin stuffed in the oven. Personally, I suspect that he was originally supposed to have actually killed her, but reaction was poor enough that they added some dialogue to the following issue to undo it. It think it was due to the backlash of another woman stuffed in the refrigerator. I think it was because Geoff wanted her to be killed by Despotellis, not Major Force. That makes sense. Johns (and Didio) certainly wanted to tear apart Kyle and his history himself.